Guess what? There is a way. The USPS® introduced a program called, "Informed Delivery®." For those that qualify, it starts by signing up online, and verifying some of the incoming mail with mutiple choice questions. In the receiver's email inbox, they will receive an exterior greyscale scan of all the letter-size mail pieces that ran through the automated Post Office equipment that morning. It includes all those names receiving mail at the receiver's address. "To automate the sortation and delivery of mail, USPS® digitally images the front of mailpieces that run through our automation equipment. Now we are using those images for a second purpose: to provide digital notifications to users in advance of the delivery of physical mail. Informed Delivery® is an optional notification service for residential consumers that sends an email to users containing grayscale images of the outside of letter–sized mailpieces that are arriving soon. The images are of the exterior, address side of household mailpieces (not the inside contents), and notifications are only sent on days when mail is being processed and delivered to the home. Users can also visit the dashboard on informeddelivery.usps.com to view their images, which are available for a seven–day period." Mobile view of Informed Delivery® email. Can I receive scans even if I do not have an email address? Yes, you can view them daily on the USPS® dashboard using your log in information. Is Informed Delivery® available to PO Box customers or businesses? No, the program could expand in the future to include these. What time should I expect to receive the email notifications?Typically around 9:00am EST, only on days the USPS® Mail is delivered. No holidays, or on Sundays. Is there added cost for this service? No extra cost to those receiving USPS® mail. 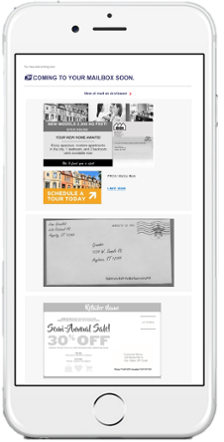 With Informed Delivery® integration, your mailing piece will be accompanied by a full color clickable ad within the grayscale email preview sent by the USPS. You will also be able to track where Informed Delivery® emails have been opened (geographically)! Over 10 MILLION users signed up to receive Informed Delivery® daily! More Impressions = More Conversions! Click here to find out more about PPS PLUS!